Fall is upon us, tis the season to waffle in those delicious fall spices and enjoy a warm bowl of soup when coming in from the brisk air. This month's theme is Soups, bacon required. That's right, your soup must contain bacon someway shape or form. Let me begin by saying...I AM SO FULL. I started this challenge with three "nevers". I've never made homemade pancakes. I've never made hollandaise sauce and I've never had eggs benedict. I accomplished all three tonight. Matt and I were very pleased with everything this evening. 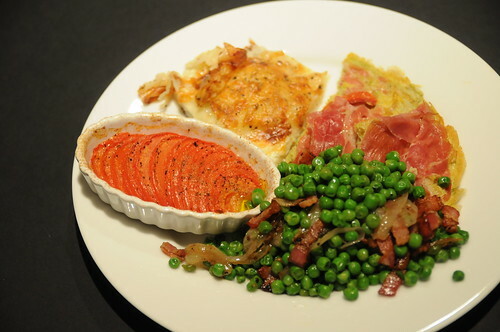 Lucky for us there are plenty of leftovers and I believe I'll be having this again tomorrow night! Making eggs benedict was much easier than I assumed. Poached eggs are now on the top of my list. I've been watching Food Network for a while now so I had a pretty good idea on the how to's including the splash of vinegar in the water. The hollandaise sauce was simple as well. You just have to keep your eye on it. But who knew that just a couple of ingredients would create such a lovely yellow concoction. The pancakes were pretty good as well. I kept them in a warmed oven until we were ready to eat so i think that toughened them just a tad. However, the topping I made for it....HEAVEN! It was a stick of softened butter (Paula Dean will love me now), three tablespoons of OJ concentrate and 1/3 cup of honey. Mix well and slather the cakes. I didn't think twice about that bottle of syrup. What's nice is that the butter mixture will go well on my english muffins. I am pretty worn out b/c I've been up FOREVER and I'm stuffed so I'll pass on detailing the recipes. However, I'd be glad to share should anyone be interested. 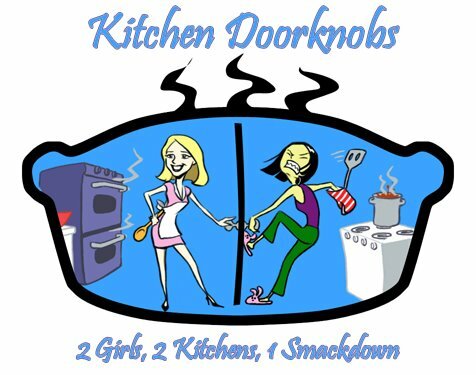 Until next time fellow doorknobs keep those buns and ovens HOT! for this month's challenge, i knew i had to make a waffle sandwich. last month i happened to mention to jab about a waffle maker, i could've sworn he had one. as a surprise he bought me one! i was so excited. at first chance, i had to make use of my new kitchen toy. naturally, i made my roommate sous chef. and we had breakfast for dinner. the poor girl had no idea what to do. i like to think that am helping her ... not only in feeding her but also giving her tips in the kitchen. the waffles came out well. i am not much of a waffle person but i did enjoy the process of making the batter and using my new maker. 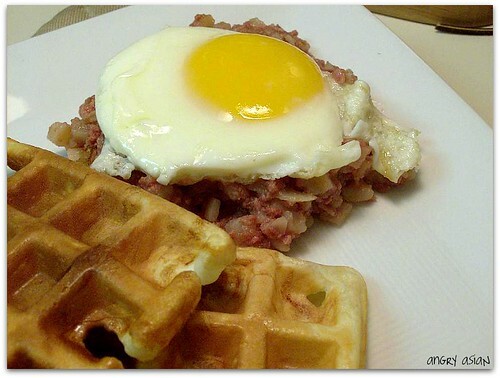 i included a side of corned beef hash (crystal's favorite) and topped it with a sunny side up egg (my fave). it felt like a slightly rushed breakfast/dinner. we were busy eatting but taking turns getting up every so often to check on the waffle maker. we ended up with quite a bit of waffles that i subsequently reheated for breakfast that week. not complaining! for "dessert" i made my waffle sandwich. 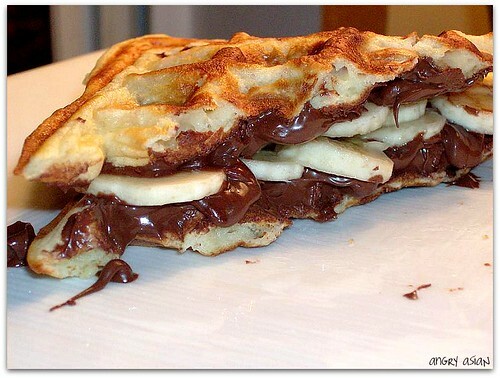 sliced bananas and spread of nutella chocolate on both waffles. it was so decadent. everything i thought it was going to be when i first saw its creation. 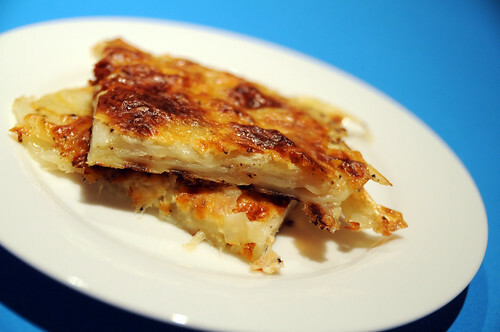 In a bake proof frying pan (or bake-ware you can skip the fry part), line the pan with one layer of the potatoes. Sprinkle some salt, pepper and cheddar cheese. Top with another layer of potatoes and repeat. Complete with three layers. Place on stove top and fry on medium heat for about 7-8 mins, this will set the galette. Pour 1/3 cup light creme over top and add a bit more cheddar cheese. Place into 375 oven for 15 mins. A piperade is a sautee mixture of peppers, onions, garlic, and tomatoes. I omitted the tomatoes in my recipe since I was going to be pairing roasted tomatoes. Crack three eggs and whisk with pepper and finely chopped jalapeno & garlic. Quickly saute onions, mushrooms in some olive oil, add in roasted red peppers as onions are almost complete. Add in beaten egg mixture (set burner to med-low). Allow omelette to set for a few minutes and then layer the slices of prosciutto on top of the omelette. Place the pan under a broiler for 3-4 mins. Cut bacon into small pieces, and saute until brown. 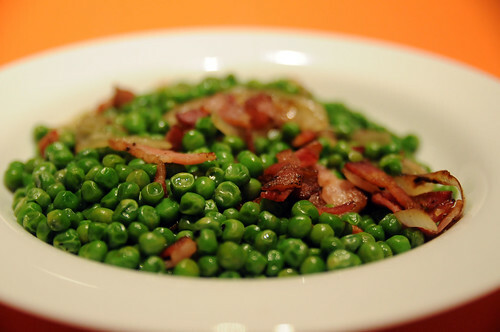 Add in onions and then peas. 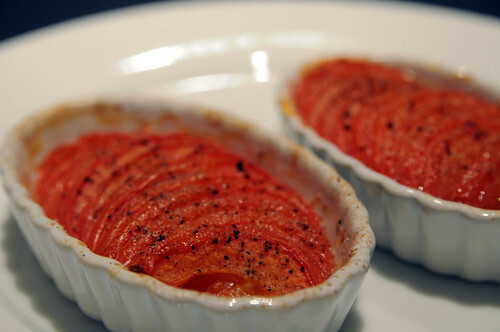 place sliced tomatoes in a bake-safe dish, top with salt, pepper, garlic and olive oil. Bake for 15 mins at 375.